Following the tragic passing of Festival Director, Sarah Nulty who died just weeks before the tenth edition of Tramlines, plans have now been confirmed for a permanent memorial to Sarah on Devonshire Green, the original main stage of the festival. A commemorative plaque will be embedded into the wall at the top of Devonshire Green, facing down towards the traditional site of the main stage. She will also be awarded with a Civic Award from the Lord Mayor of Sheffield, Magid Magid. Devonshire Green was the original Tramlines site back when it all first began in 2009. Festival organisers and council representatives have decided that this is the most fitting place for a memorial to Sarah. Bands, organisers and attendees have been showing their support for Sarah by wearing ‘BeMoreNulty’ t-shirts. 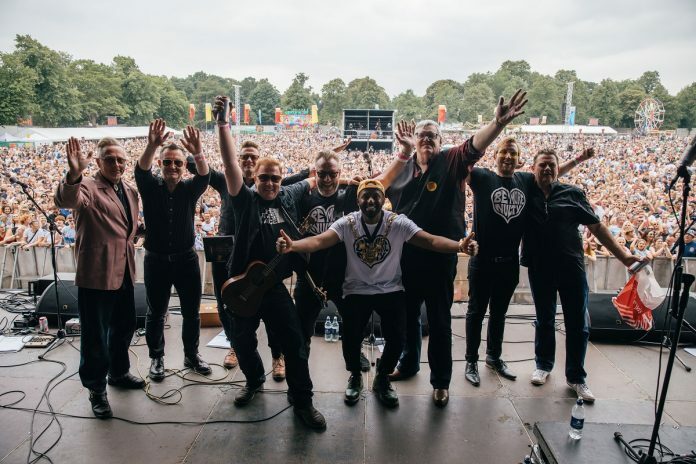 Acts including, Reverend and the Makers, Milburn, Universal Tree, Bang Bang Romeo, Everly Pregnant Brothers and many more all paid tribute to Sarah during their performances. There was also a memorial video presented by Timm Cleasby and shown on big screens from the main stage on Sunday evening with the audience of thousands joining in with a minute’s applause for Sarah. The ‘BeMoreNulty’ t-shirts are on sale via the Drop Dead website with all profits (along with proceeds from ‘Nulty’s’ backstage bar) donated to Weston Park Cancer Charity and Cavendish Cancer Care. Charity donations from the guestlist will be split between Weston Park Cancer Charity, Cavendish Cancer Care and Crohn’s & Colitis UK. At Heart events we are very excited about our new short season of jazz gigs, which we are putting on with Leeds College of Music (Jazz Course). All the musicians are current students at the College and will be offering an eclectic and stunning selection of jazz, in all its many guises. The sessions will take place in the Assembly bar and kitchen. Donations on the door, £3/£5 if possible. For this second gig in the series we have Pure Sketch and Zenith Group. Pure Sketch are a bebop five piece jazz band that performs a mixture of standard pieces and originals. They are influenced by great musicians like Duke Jordan, Horace Silver and Joe Henderson. Their originals are also inspired by these musicians and hope to transport you back to the same era of music whilst maintaining a fresh outlook. Zenith Group combines heavy, funk-infused groove with the jazz-tinged harmonic sensibility that characterise the flowing and quick-witted improvisational dynamic of this quartet’s burgeoning style. Twisting styles, blurring lines and effecting tones, Zenith Group take a firm hold of the baton passed by contemporary greats including Steve Coleman and Tim Garland, bounding toward their own finish line without looking back. Big Mo’s Big Trio pay homage to many great composers renowned for being years ahead of their time such as Oscar Peterson and Bill Frisell, and also modern greats such as Bob Reynolds and Dave Weckl. A fresh sound not to be turned a blind eye to. The Terra Project is a collection of singers determined to show the world the power of the voice. The group is made up of a unique line-up including five singers with percussion, drums and double bass. They perform original music inspired by Jazz, Folk and World Music and often create improvised pieces. Their motto is the voice has no limits and this shows with their exploration of rich harmony, bass lines, vocal percussion and soundscapes. Mali Hayes is a young singer/song writer based in Manchester/Leeds. Her songs stem from many experiences in her life, taking the audience on journeys with her captivating lyrics, indulging use of harmonies and ambient vibes throughout her music. Mali’s music is perfumed by the likes of Erykah Badu and Jill Scott, coloured by the likes of Lianne La Havas and India Arie, and flirts with the likes of D’Angelo and Hiatus Kaiyote and Mali continues to experiment incorporating different elements of musical styles into her songs. After studying Popular Music (BA) at Leeds College of Music, it has given Mali the opportunity to work with many different musicians, singers and producers which gave her the opportunity to define her sound and find herself as an artist as well as performing backing vocals for the likes of JP Cooper (Island Records) and THE Tito Jackson! ‘A really great new British female vocalist from Manchester..
It’s so convenient these days to introduce a new talent by comparing them with other ‘similar’ established artists, somewhere in the same zone of musical ability. To play that lazy game would do a great disservice to this wonderful new artist. Great singers capture the true beat of a heart, the stillness in the air, the scent on breeze or how dark and deep the night seems. Mali’s pure, simple, mellifluous voice is able to do this and at her tender age the best is yet to come. Mali’s supple voice floats over the brilliantly apt musical arrangements, flowing and ebbing, gently twisting through her songs. It’s a blissful experience! UNKNOWN ERA – a bunch of misfits that defies categorisation. With 9 members’ worth of influences and inspirations (and with lead vocal duties shared amongst 4 of ’em) Unknown Era was always going to be an interesting project. It’s been a pleasure to watch them grow from their formation and early shows into the absolutely belting band they are today. After heading up from Nottingham for the first time to play main support on Counting Coins’ debut album launch a few years ago, they’ve been back on their own merit several times since, bringing their upbeat mix of hiphop, soul/funk, reggae, rock, DnB, Disco, and whatever else they fancy throwing in to the pot. It’s a wild ride, so buckle up. FLATCAP CARNIVAL are a York-based band boasting a 3 piece brass section, who describe their sound as a Latin-infused skanival, and cite The Cat Empire and Fat Freddy’s Drop amongst their influences. Plus their beard game is pretty strong. It’s their first time in Hull so arrive early and show them how we do it… Dancing shoes recommended, flatcaps optional. The Misophone Collective is an assortment of musicians from Leeds and Manchester, borrowing players from both The Daphne Duo and the Klezmer band Kibitz. The collective was formed out of a love for all the things gypsy jazz and the line-up is variable according to the occasion and performance space. For those unfamiliar with many of the old jazz standards, The Misophone collective has taken an assortment of modern popular tunes and added a dash of gypsy flair to them. The violinist and guitarist (The Daphne Duo), both currently study classical performance at The Royal Northern College of Music in Manchester, so this band is an outlet for their creativity. The remaining members of the collective may well be known to you as musicians regularly frequenting venues in and all around Leeds. This band aims to have something to suit every taste, with music ranging from sultry to zesty! Suggested donations of £3-£5, but no one turned away for lack of funds. Enter your email address to subscribe to LSF updates and receive notifications of new posts by email.